Whether you serve this in a wrap or on a crisp iceberg lettuce, you will love this mouth-watering whole egg salad which makes for a yummy dinner. Eggs are a very good source of protein and the egg whites are rich sources of selenium, vitamin D, B6, B12 and minerals such as zinc, iron and copper. 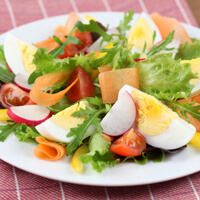 Keyword Whole Egg Salad Recipe! For the dressing, in a small bowl, add salt, pepper and olive oil. Mix it and keep aside. Drain and peel the boiled eggs and cut into sixths. In a large bowl, mix together the bell pepper, onion, tomato, black olives and the pieces of eggs. Then put some lettuce and pour the dressing over it and serve. Also read about: Italian Style Mushroom, Broccoli Hung Curd Salad!